Italian Canadian internee, Osvaldo Giacomelli, stands in front of camp vegetable garden. Camp guard tower is visible in upper centre background, as is a line of laundry. Given the informal setting, it is unlikely the picture was officially authorized. This image was likely taken at the same time as DICEA2011.0001.0012, DICEA2011.0001.0013, DICEA2011.0001.0022, DICEA2011.0001.0028 and DICEA2011.0001.0029. The location of the photograph is not conclusively known. However, given other photographs (see DICEA2011.0001.0001) it is likely that the picture was taken in Fredericton Internment Camp in 1943. Internees were treated well by Internment Operations. The men note that they were fed three meals a day. However, internees also note that on first arrival camp food was intolerable. It was only when the Italian Canadian internees took over the camp kitchen, including the use of food grown in their own vegetable gardens, that the diet became appetizing. Breakfast included coffee, milk, oatmeal, bacon, fruit juice and eggs. Lunch could feature soup, meat and vegetables, and omelettes. Dinners alternated between meat or fish, with vegetables and pasta. Depending on the season, internees also received apples or a salad. Bread was included with all meals. They were also allowed parcels from home which often included Italian foodstuffs, including olive oil and fruit. This photograph belongs to a collection owned by Osvaldo Giacomelli. Previous to his death, he had spoken on the record about his internment to journalists and academics. Some suggestion has been made that Giacomelli was a fascist supporter and Mussolini-adherent. 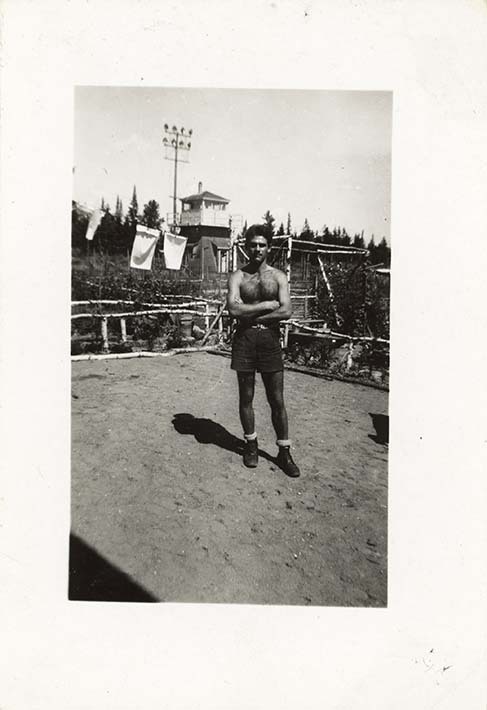 He was one of the longest-serving of the Italian Canadian internees, released on May 29, 1945. Giacomelli himself felt that he was wrongfully interned, and sued the Government of Canada in 2005. When Giacomelli died in March of 2006, his case was still unresolved.